Give your evenings the added warmth and sleek styling of this stainless patio heater. Putting out 46,000 BTU's this heater is sure to heat your outdoor space making anytime of year comfortable. Featuring wheels which make transportation easy, it is simple to set up and uses a standard 20lb propane tank. A stainless steel burner and grid makes this patio heater easy to clean and maintain. This CSA approved patio heater also includes a tip over protection safety feature. 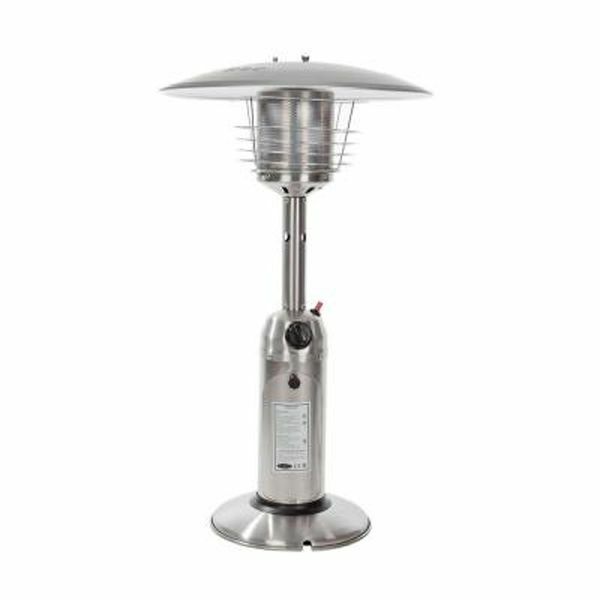 Stainless Steel Table Top Patio Heater is rated 4.0 out of 5 by 2. Rated 4 out of 5 by Blaine from Great product. Exactly like it is described and works great. Love it! Rated 4 out of 5 by canuckgal61 from Perfect heater for my deck! I bought this online last week and received it today. I just put it together and it seems to be everything I expected. I hope it continues that way for years to come. The instructions are not the clearest but I managed to get it together in no time at all.